A.B. 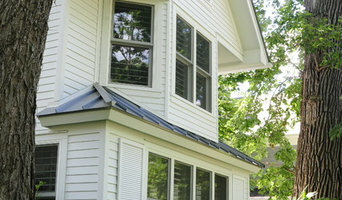 Edward Enterprises, Inc. specializes in roofing, siding, windows, gutters, masonry and more. As an all exteriors company since 2003, A.B. Edward has performed projects for over 4000+ Chicagoland area homeowners and continues to deliver a solid, unblemished A+ BBB Rating along with being an Angie's List Award recipient. Let us protect and improve your biggest investment, your home! FREE ESTIMATES! KWM Designs is a residential interior design company that focuses on remodeling kitchens, bathrooms & basements. Projects range greatly in style from traditional to contemporary--every project is a unique reflection of the home owner. Karen completed her undergraduate degree in interior design, graphic design, and business, and has worked in interior design for 20+ years and operated her own business for 10+ years. She takes great pride in the fact that most of her business comes from long-term, repeat clients and referrals, many of whom she has traveled all over the USA to continue to provide them with her professional design services. The PKPG Companies were founded in 2009 on the principle of creating a company that’s “Built to Last.” We believe this to be possible by having an organization capable of delivering on any project regardless of size or complexity and by doing this, we expect to become one of the Northshore’s most respected and sought-after homebuilders, recognized for quality and an easy approach to building a home. As strange as it may sound from a homebuilder, we don’t begin our work by thinking about a house. Instead, for every home we will build, we start by considering those who will live there. We contemplate their ever-shifting needs. We imagine what innovations will make life more delightful and what conveniences will satisfy year after year. This is no fanciful exercise, but a disciplined approach to creating the finest, most livable homes imaginable. As you move from room to room, it’s our intention that you’ll experience luxury wherever you pause in your home. Proud as we are of all we build, our homes are not about us. They are about you, your standards, your life. For all of us at the PKPG Companies, it is a privilege to build your home. With that privilege comes tremendous responsibility, which is why we have devised superior processes that allow us to listen accurately, communicate honestly, think creatively and build professionally. We hope you will tour this website fully but in the event you have unanswered questions about our homes, we welcome you to contact us via phone (847) 730-5652 or email: info@pkpgcompanies.com at any time. But before you start sending out dozens of emails and making phone calls, sit down and think about your project. What's your budget? What is the scope of your project? Will you need more than one type of professional to complete your home improvement project in Glenview, IL? Can you afford to complete the full project now, or should you tackle it bit by bit? Once you've settled on your project’s priorities, budget and scope, it's time to start researching Glenview, IL home design professionals. Don't sell yourself short and settle on the first professional you set your sights on. Make sure that you're working with someone local, who can get to the jobsite easily and efficiently. Look into the person’s reviews, ask to speak with former clients and to see previous jobs in person. Take a good look at their portfolio photos: How similar are these projects to your own? Be honest — that mansion might look beautiful, but it might not have a lot in common with your little bungalow. Reach out to multiple professionals — especially for larger projects — and don't settle for the first bid you hear. Comparing multiple Glenview, IL professionals' bids and experiences can help you find the one that’s best for you. Ask a lot of questions now, so you won't have unexpected answers later. Find a home design professional on Houzz. Narrow down your search by type of professional and location. Browse Glenview, IL portfolio photos, read client reviews and contact each Glenview, IL professional for more information. Check out the information in the specialized professional sections too for tips on how to hire the right professional for your project.